As 19th September 2011, US based energy company Noble Energy is starting to drill for gas off Cyprus in Block 12. The company has already conducting exploration for gas off the Coast of Israel and found some large gas reservoirs. Block 12 lies just across the border of the Israeli-Cypriot maritime exclusive economic zones from Leviathan. 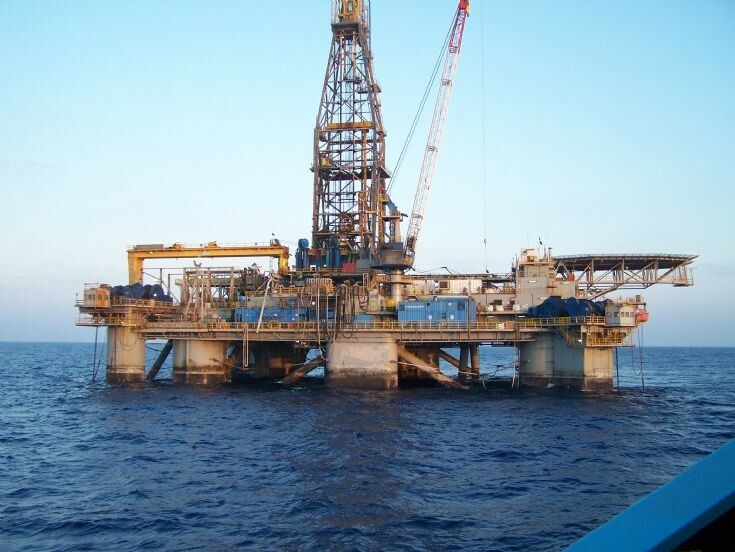 Noble Energy has had the concession to Block 12 since 2008, and under a March 2010 agreement, Avner and Delek Drilling have an option to 30% of the concession. Under the terms of the exploration license, Delek Drilling and Avner will bear 15% of Noble Energy’s expenditures for Block 12, including exploration and appraisal wells, development or production, and/or other operations, in accordance with the Production Sharing Contract. The deadline for the Cypriot authorities to approve the transfer of rights to Block 12 has been extended to August 1, 2013. Until then, Avner and Delek Drilling can transfer their rights to a third party acceptable to Noble Energy and subject to approval by the Cypriot authorities. Noble Energy is due to begin drilling an exploratory well in Block 12 by October 1. Until the Cypriot government approves the transfer of rights in Block 12 to Avner and Delek Drilling, they will have no access to any confidential information about Block 12 activities nor influence on drilling decisions. Turkey objects to any exploration of hydro carbon resources off the coast off Cyprus before a solution is found to the separation of the two communities living on the island. This not going to happen soon (if at all). The Greek Cypriot part is recognized as the Republic of Cyprus in the international arena and is a member of EU. They have diplomatic and economic backing from EU and they effectively and successfully excluded the Turkish community after Turkish invasion in 1974. And in my view the Greek Cypriots do not have any reason to end this separation as they are better off divided. Greek Cypriot officials last year accused Turkish navy ships of interfering with an offshore oil and gas survey off Cyprus’ south coast. Ankara also insists that Turkish Cypriots, who run their own state in the north of the island, should have a say in the island’s oil and gas rights. Turkish Cypriot Foreign Minister Hüseyin Özgürgün said last week oil and gas exploration could harm ongoing reunification talks. At the heart of the problem lies the division of the EEZ boundaries in Eastern Mediterranean. 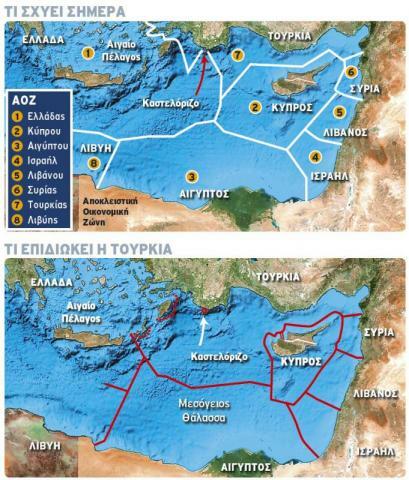 What Cyprus and Greece want to achieve is to bottle up Turkey and divide the most of the EEZ between themselves. Turkey does not approve this notion. The current political crisis between Turkey and Israel over the Israel’s refusal for an apology for the killing on board of M/V Mavi Marmara gives Turkey a very good reason and opportunity to send its warships to the region. But apparently Turkish is not the only nation interested in sending its warships to the region. Russia has sent two nuclear-powered submarines to patrol Eastern Mediterranean waters around Cyprus and enforce the island’s right to explore for undersea oil and gas in its territorial seas, according to information from Defencenet.gr, citing a Russian FM spokesman. Well sending submarines is a very easy thing to do. Unlike surface warships the main purpose of any submarine is to remain unseen and unobserved. This stealth nature of the submarines makes it impossible for most of the common folk to see if they have been actually send or not as it is not possible to prove either the presence or the absence of the submarines. But why on earth is Russia involved in the Eastern Mediterranean? The support of Moscow to Nicosia for exploitation of the EEZ is by no means accidental. Besides the enduring friendship of the two countries, a “serious game” is unfolding on the background. The Russian state company Gazprom, which is currently the Number 1 player in the international gas market, is interested on securing rights to gas fields in Cyprus. Indeed, according to information from “Kathimerini”, the Russian giant has shown strong interest in two fields, whose rights will be claimed in the second licensing round, expected on early 2012. In the meantime the tension remains high between Turkey and Israel. Two sides showed some muscles last week. The Israeli Armed Forces have made the high seas successful test of missile defense system Barak. The exercise scenario involved the simulated incoming enemy missile in which the system failed to stop, according to a statement a senior Israeli Navy. The system has undergone Barak upgrades that enable it to successfully intercept most advanced missiles, firing missiles against them automatically. The emphasis given to the system because it has increased the danger of missiles against surface vessels, such as the Russian-built Yakhont which acquired the Syrian armed forces. Usually, weapons systems deployed by the Syrians, sooner or later end up in the hands of the Lebanese Shiite organization Hezbollah. Turkey threatened to veto Israel, if the Jewish state establishes an office as part of NATO’s Mediterranean Dialogue initiative which Israel is a part of along with other six countries. And Turkey published photos of the first test firing of its own stand-off munition know as Stand-off Precision Guided Munition (SOM). Turkish air force has recently displayed its first medium range Stand-off Precision Guided Munition (SOM). Missile has been displayed along with F-16 fighter jets. SOM is developed by the Tubitak-Sage for the Turkish Undersecretariat for Defence Industries. Turkish Stand-off Precision Guided Munition (SOM) also offers features like In-flight Mission Selection Re-Targeting, Resistance to Counter Measures and Chaff. Contract was awarded to the Tubitak-Sage in 2006 for the development of a medium range Stand-off Precision Guided Munition (SOM) which can be launched by the fighter jets of the Turkish air force. Turkish Stand-off Precision Guided Munition (SOM) has a range of over 180 kilometers when launched by the fighter jets. 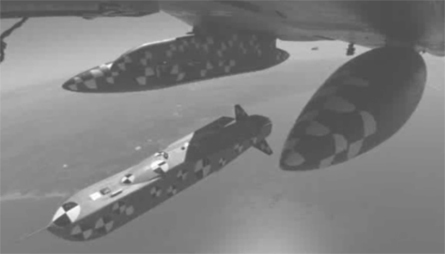 SOM is reported to have extremely high accuracy to destroy its intended targets with pin point accuracy. SOM uses combination of Global Positioning System (GPS)and inertial navigation system (INS) for inital flight while a Aselsan-built infrared imaging guidance is used for the terminal attack to ensure the precise strike. I have tried to summarize what happened in the last couple of days in the region. The tension in region will remain high. So stay tuned. Click for the second part. Money, money, money. This is all about money. I think all the young men and women of the respective armed services involved should refuse to perform anything that might cause harm to each other. In addition, when the bodies of these young people start coming home in bags the respective populations will be angry when they realize that their children died so someone could make a profit.